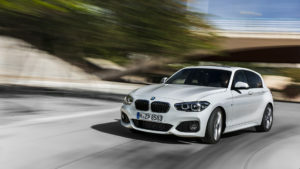 The BMW 1-Series isn’t an attractive looking car and there are no two ways about it. In reality the 1-Series has given birth to the X1 but in India the X1 came first and thus the 1-Series appears to be a X1 turned into a hatchback. The end result is a car which although proudly boasts of the BMW badge on its long hood, doesn’t solicit a second glance on the road. The 116i comes with 16-inch wheels which look a bit puny on this car. The rear is very plain too and overall this vehicle doesn’t make a visual impression. In spite of being in the market for more than 8 months now, the styling fails to grow on you. Every car in the BMW 1 Series range has a standard 6.5in colour screen, mounted on top of the centre console. It’s controlled via the iDrive system, which is one of the most intuitive and user-friendly interfaces around. There is a large rotary control wheel near the gearstick, with simple shortcut buttons for all the major functions. The graphics are slick and the menus only take a moment to get your head around. Bluetooth and audio streaming, a single CD player, a DAB digital radio, multifunction steering wheel and USB connection are also standard across the range, with the option to upgrade to an excellent Harman Kardon stereo, or even a larger display screen and sat-nav with real time traffic information and mobile internet services, plus a 12GB music hard drive, as part of the BMW Professional package. Only the 116d ED Plus model gets sat-nav as standard. Fit and finish in the BMW 1 Series is well above average, although a few pieces of trim – especially the door pockets and the glovebox lid – feel quite hard and scratchy. There’s a nice mixture of brushed metal and gloss black surfaces in higher spec cars, but they can also be fitted as options on entry-level models. All the major controls are solidly built and robust, although the indicator stalks and stereo controls are made from harder, flimsier plastics. In terms of its rivals, the Audi A3 and the Volkswagen Golf feel plusher, but only by a narrow margin. A pair of four-cylinder engines power this smallest of BMWs, one petrol and one diesel. The 1,995cc ‘N47’ diesel is a familiar one; we’ve already seen it in ‘20d’ guise in the 3-series, 5-series, X1 and X3, as well as in the 525d. However, here, in the 118d, it makes 141bhp and 32.6kgm. These figures still compare favourably with the diesel engines of its closest rivals, the A-class and the V40 Cross Country. A pleasant surprise is that it is quite refined; almost more so than a 3-series. The NVH levels are impressively low, both at idle and on the go, and it gets harsh only near the top of the rev range. This milder state of tune suggests less aggressive turbo-charging, which means less noise. The power delivery is smooth. This engine is incredibly linear for a diesel, and while you enjoy the almost petrol-like journey up the power band, you do miss that characteristic surge of torque that you get in the mid-range with most diesel engines. Put it in Sport or Sport+, however, and you’d better have a clear stretch of road, because the engine responses quicken and the transmission just darts through the gears. Keep your foot in, and it won’t shift up until its 4,800rpm redline. Overall, the power delivery gets in its stride at about 1,500rpm, and builds strongly till about 4,000rpm. The 118d hits 100kph in 9.02sec, just 0.4sec after the V40 and much ahead of the diesel A-class. The petrol is a 1,598cc, direct-injection, turbocharged motor that makes a healthy 134bhp and 24.47kgm of torque on overboost. Like the diesel, it is only available with the ZF automatic and that’s a good thing. Unlike the earlier, naturally aspirated BMW petrols that loved to be revved but had weak mid-ranges, this turbo-petrol has a meaty and wide torque curve. The ZF ’box masks whatever minimal turbo lag there is and the engine will spin happily to 6,500rpm, accompanied by a nice exhaust snarl and a muted turbo whistle. Euro NCAP has recently made its crash tests more stringent, but the 1 Series scored highly in the old tests with a five-star result, and did well in all areas except pedestrian protection. There are six airbags and tyre pressure-monitoring on all models, and run-flat tyres are included on many models. However, the 1 Series doesn’t get emergency automatic braking, adaptive cruise control or collision detection. At least security body Thatcham rates it highly for being difficult to break into, or steal from. If you need a reduced and truly lively hatchback that consolidates solid execution with light-footed back wheel-drive taken care of, one and only auto will figure on your shopping rundown: the BMW 1 Series. The BMW 1 Series has earned the full five stars in the NCAP accident tests and gloats an especially great grown-up inhabitant assurance rating of 91%. Early-life unwavering quality is great, however as the miles mount up, it has a notoriety for giving inconvenience. BMW 3 Series Ex Showroom Price in New Delhi ranges from 36,30,000/- (3 Series 320d Prestige) to 44,40,000/- (3 Series M Sport) .BMW 3 Series has 7 Variants of Diesel are available in India. BMW 3 Series comes in 8 colours, namely Alpine White (non-metallic),Mineral Grey,Glacier Silver,Crimson Red,Deep Sea Blue,Black Sapphire,Valencia Orange,Midnight Blue.